In one of those flights of fancy beloved of the Anglo-catholic movement before it met its Waterloo at the 1992 General Synod, the 1976 guidebook for Great Witchingham could imagine the church back into the early 16th century: Through the chancel screen we see the High Altar, even more richly decorated; four lighted candles stand upon the altar (possibly without precedent elsewhere in England) and many more surround it, whilst above the altar the blessed sacrament is reserved for the sick in a silver pyx. 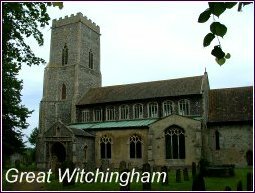 At Mass time on Sunday, the whole population of Witchingham throngs the nave, people chatting to each other from time to time. Latin phrases filter down the chancel, lights flicker, stained glass glimmers, incense smoke ascends, and bells ring. 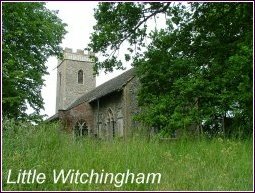 Today, the two Witchingham churches stand as remotely as they have ever done from civilisation; even more so, for the countryside around would have thronged with farmworkers and those who kept these villages self-sufficient until well into the last century. Now, they are empty, silent, apart from the obscene intrusions of jet planes screaming low across the fields and copses. Great Witchingham church still has its village, of sorts; perhaps a dozen houses all told clustered about the three narrow lanes that come together here. Little Witchingham church is far more remote, impossible to find without a map, in a maze of high-hedged lanes surrounded by woods and barley fields. In early summer the lime trees sweep their wide arms about Great Witchingham church, as if beginning to engulf a fairy castle; Little Witchingham churchyard is a sea of high grasses, the few remaining headstones bobbing determinedly. One of the tenets of the Anglo-catholic movement is that there is a direct line between the medieval Catholic liturgy and the way we worship today. In a way this is true, but the idea that the line is unbroken does not bear too much examination. The modern Church of England is essentially a late 19th century invention, and before that these buildings were preaching boxes for at least 250 years, their congregations focused on the pulpit rather than the altar. The medieval interiors of English churches are Victorian reinventions, what the 19th century thought the 15th century looked like. And yet, each of these two churches contains an extraordinary medieval treasure, each one of the best of its kind anywhere in England. Despite the best attempts of puritans and iconoclasts, they have survived, because they were hidden. At Great Witchingham is one of the finest of all the Seven Sacrament fonts. England has forty of these, and more than half are in Norfolk; most of the rest are in Suffolk. Great Witchingham's font stands alongside that at Westhall in Suffolk as being one of the two most haunting, because they still retain almost all their medieval colouring. Great WItchingham's font is not as characterful as Westhall's, but it retains a feature which makes it wholly extraordinary; the eighth 'extra' panel depicts the Assumption of the Blessed Virgin Mary into Heaven. This occurs on fonts only twice elsewhere in East Anglia; on the font at Bridgham in Norfolk, and on the Mysteries of the Virgin font at Ipswich St Matthew in Suffolk. The doctrine of the Assumption was central to late medieval East Anglian worship; it was the dedication of more than half the churches in the region, and its celebration on the 15th August, at the height of the harvest, was the third great festival of the year after Easter and Christmas. It was wholly frowned on by the Anglican reformers, who excised it from Anglican doctrine and the Book of Common Prayer. Its imagery was scoured from English churches, except where it was hidden; we know that many fonts were plastered over to hide their imagery (not to save it, but to remove it from public view) and that is almost certainly what happened here. Seven Sacraments fonts are reminders of a reforming movement in the Church that began a full century before the English Reformation. During the 15th century, there seems to have been an attempt to assert orthodox Catholic doctrine. Why did this happen? Some books suggest that it was in the face of heretical movements like Lollardy; but Lollardy can never have been that influential, even in East Anglia. It seems more likely that an emergent middle class, who were strong in this cloth-producing area, attempted to close the gap between their educated, articulate theology and the superstitious practices and beliefs of the ordinary working people. And so, in came the Seven Sacraments fonts, bench ends and wallpaintings depicting the Sacraments, virtues and vices, and up went the great roods, to remind the common people of the central mystery of the Christian faith: the incarnation, death and resurrection of Jesus Christ. At this time, all churches became seated, and large windows were punched through walls to illuminate the shadowy places. Pulpits appeared now, a century before the protestant reformers asserted their power, and more importantly many older wall paintings were whitewashed over. Why was this? Many that were lost depicted the lives of Saints, and perhaps it was thought they were a distraction, open to abuses and superstitions. Most of the wall paintings that survived into the 16th century appear to be those concerned with Catholic doctrine, and certainly none at all survived unwhitewashed to incur the wrath of the Puritans a century later. In his progress around the counties of Suffolk and Cambridgeshire, government-appointed iconoclast William Dowsing did not see a single wall painting. It is to Little Witchingham that you go to find one of the finest sets of wall-paintings in Norfolk. They appear to date from the first half of the 14th century, during that great flowering of artistic endeavour that would be cruelly brought to an end by the Black Death, which killed perhaps a half of the population of East Anglia. Indeed, in a fascinating aside, the guide book theorises that the south nave wall has been prepared for painting, but that this never happened. Perhaps the pestilence intervened, and as at Kersey in Suffolk left in evidence the Dog That Didn't Bark. On the south wall, the wall paintings depict the Passion of Christ, and what is probably a panoply of the Apostles. On the west wall, too indistinct to make out now, were doctrinal paintings; the Three Living and the Three Dead, illustrative of the transitoriness of earthly wealth, and what may have been Christ in Majesty. Looking at them, I couldn't help thinking that they are assertive of orthodox Catholicism, and perhaps they were evidence of an even earlier date for my proto-reformation? The south aisle is more curious; on the outer wall are fragments of figures and scenes that could be anything, but as one appears to show a ram caught in a thicket, and another a King and Priest side by side, perhaps they are episodes from the Old Testament. These are unusual subjects for a 14th century painting, but even stranger are the huge roundels set above the pillars on the south side of the arcade. They depict the symbols of the Evangelists, and quite frankly they look so Victorian that they might easily have come from high in the roof of some 19th century Brighton Anglo-catholic citadel. But the Victorians did not know about any of these paintings. We know this because this church was little-used even then, and by the start of the 20th century it was abandoned. In 1967, the enthusiastic art historian Eve Baker found it ruinous, roofless, and full of elder trees and ivy. The story goes that she climbed in through one of the empty windows, began stripping away ivy and found that the whitewash came off with it, revealing marvellous things. Thanks to the Norfolk Churches Trust, a plan of repairs was put in place, and the wall-paintings were properly excavated in the early 1970s. This perfect little church is now in the care of the Churches Conservation Trust. 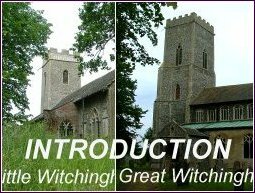 I told my companion, Tom Muckley, that I thought Little Witchingham church a magical place. Tom wondered if I would have found it so magical if it had just been another struggling Anglican church, and I guess he is probably right. The Great Witchingham font and the Little Witchingham wall paintings are equally dazzling and bewitching. They are outstanding national treasures, and if they were in the Victoria and Albert Museum we would all enthusiastically head up to London to see them, and pay willingly for the privilege of doing so. And yet here they remain, in situ, lost in the remote Norfolk countryside, one in the care of a well-meaning but overstretched parish council, the other in the hands of the saintly enthusiasts of a charity. How long can this be sustained? The villages around here are tiny, and the people responsible for far greater churches than these; the giants of Cawston and Salle, for example. Ageing, declining congregations may be as full of enthusiasm as ever, but theirs is a position that cannot last, and the slow managed decline of the Church of England must not pull these amazing, bewitching treasures down with it.